Jafferjee Brothers is a leading Sri Lankan family owned business conglomerate engaged in a diverse range of activities. 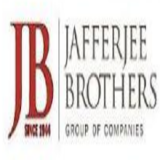 Jafferjee Brothers was founded in 1944 and counts over 60 years experience in dealing with international markets and customers. The Group is currently engaged in the export of Tea & Herbal products, Apparel products, Activated Carbons, Coir Fibre products, Moulded and Extruded Rubber products, Financial Services and most recently in Power Generation.